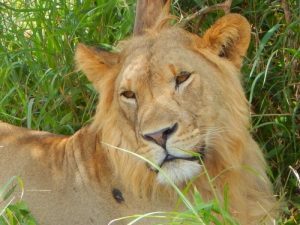 The “Big 5” includes lions, leopards, elephants, rhinos and Cape Buffalo. Not, “Did you see all of ‘The Big Five’ animals?“, or “Could you sleep knowing that lions were outside your tent?” No, nothing so pedestrian. He was curious about our culinary options while we were on safari in Kenya and Tanzania. The apple doesn’t fall far from the tree. Let me set the record straight. We didn’t go there for the food. A top of the bucket-list trip, we went there to witness self-contained ecosystems where elephants, giraffes, monkeys, rhinos, zebras, hippos–just to get started–roam free. On numerous photo-game drives, our savvy guide navigated us through the great parks in the Subsaharan, enabling us to glimpse how life may have looked before us humans arrived on the scene. 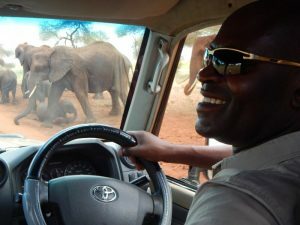 Lori’s and her conservation foundation, Amara, have spent the past 20 years engaging with Kenyans and helping them to preserve their environment. African version of the American’s South, Meat and Three. Another (more humbling) reason for this trip was to view Amara Foundation in action. The woman who spearheaded the foundation, Lori Bergman, is a good friend I met many years ago in Ann Arbor. About eighteen years ago, she went on safari with her sister to Kenya. She returned to town, quit her job and told us her plans were to engage with Kenyans to be of assistance in preserving their amazing environment; to help eradicate, for instance, bush-meat and ivory poaching. 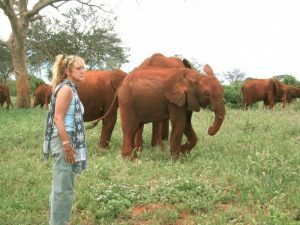 She moved to Kenya and founded Amara Conservation. The results of her efforts have been awe-inspiring. My Ann Arbor pals and I are so proud to be her friend. I could go on and on about her fascinating work, esp. in vulnerable Tsavo, but it’s all on her site. But back to my son’s original question. What did we eat? Aside from the heavy Indian influence of options (think dals, chapati, biryani) in Kenya, the typical offerings we enjoyed in Kenya and Tanzania transported me back to my childhood. Having grown up in Alabama, what us Southerners consider our heritage dishes were actually brought over via the Atlantic Slave Trade. For during the 16th through 19th centuries, with the slaves came their agricultural practices and recipes. 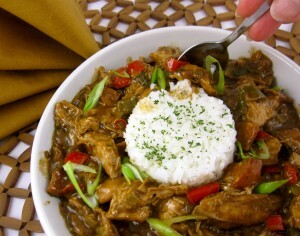 Hop ‘n John, a beloved Southern Rice & Pea Dish, had its roots in West Africa. Yep. That lip-smacking Meat & Three found at every Southern diner worth its salt has it’s genesis with the roasted meats (Nyama Choma), sautéed collards (Sukuma Wiki), and an assortment of legume concoctions such as Beans and Corn (Githeri) served in Africa. 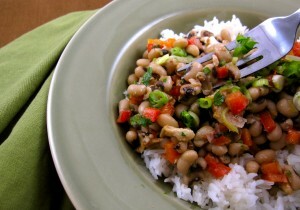 Let’s not forget the okra, black-eyed peas (I’m looking at you Hop ‘n John), peanuts and and a cornmeal staple (oh well, grits) on today’s typical African plate. Uncomfortable to be sure that an enslaved people brought me my beloved soul-foods, at the very least I give credit where credit’s due. And the feasting continued upon our return to Ann Arbor. Good friends, Terri and Frederic, hosted a dinner party upon our return featuring African fare (see lead picture). 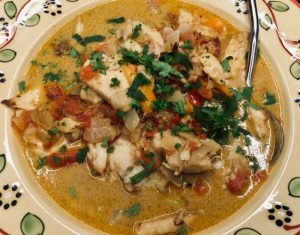 Terri made a delicious Swahili Seafood Stew. 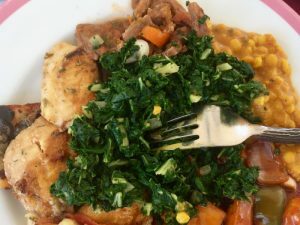 She found the recipe online and for good reason the dish tasted so familiar; the recipe was crafted by a Kenyan chef. It was superb (she used tilapia, a sub-Saharan staple), and I look forward to making it again before hot soup season disappears. Other recipes we enjoyed–a colorful couscous salad and Apricot Chicken Stew— took their influence from Morocco. A cuisine unto its own, it does, at least, share the same continent (-: I took further license making a classic Indian Dal, which as I mentioned, was served throughout Kenya. 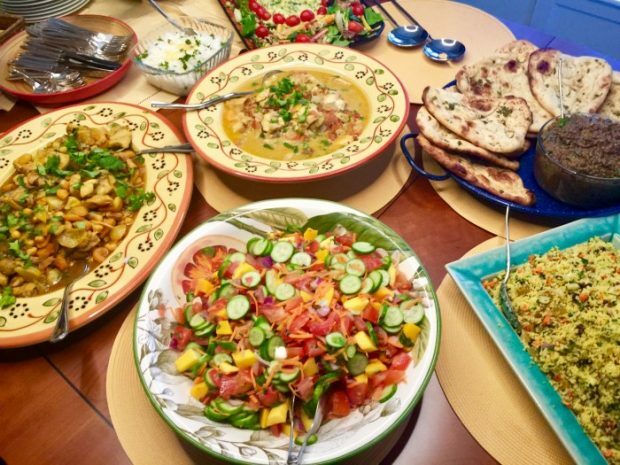 Terri’s table was truly a melting pot of colorful and exotic flavors, like the great continent itself. Happy, as always, to supply travel or culinary details, if you desire! Happy Trails! Scarola e Fagiole: White Bean and Escarole Soup with Pancetta. 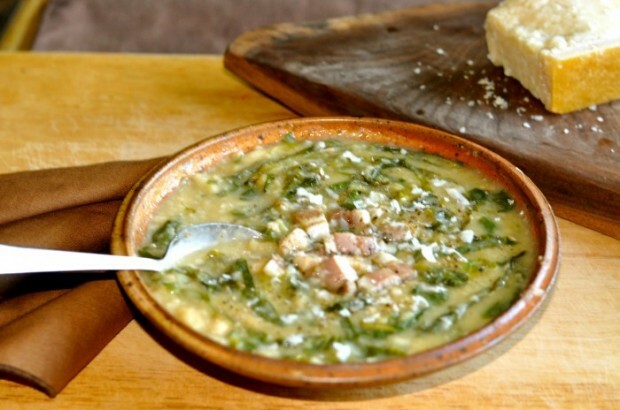 This is a hearty soup enjoyed in the wintry months in the Campagna region of Italy. 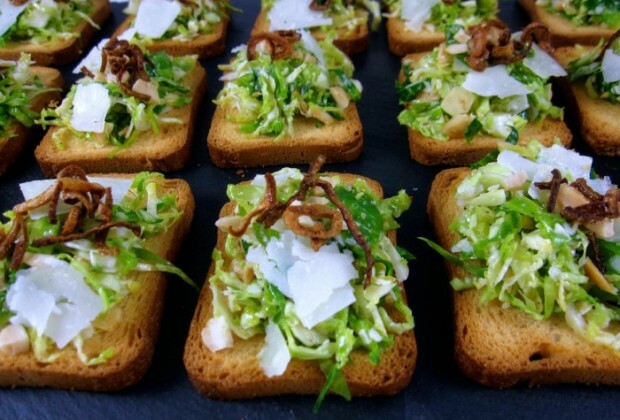 It’s a delicious way of showcasing escarole, a slightly bitter green, delightful in this recipe. Pozole: Traditional Mexican Soup. 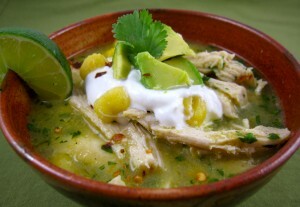 This is an abbreviated version of a Mexican classic typically served during the holidays. I love the combination of hominy and salsa verde in the brew but the garnishes are what give it personality.I make mine with fistfuls of cilantro, topped with creamy avocado. 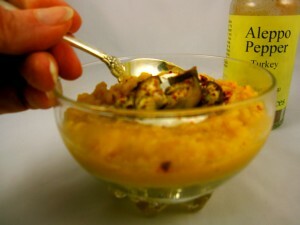 Turkish Lentil Soup with Roasted Eggplant and Yogurt. Nothing is easier than making a soup with red lentils. Honestly, it’s about as easy to make as it is to open a can– the lentils break down into creamy, buttery richness in no time. I added roasted eggplant and sour cream to this feast of simplicity. Gumbo Ya-Ya My sister-in-law is going to be dancing in one of the Mardi Gras parades (the Krewe of Poseidon) this March and I’m beside myself with jealousy (-: She’s been practicing with her group, the Disco Amigos, for months, the troupe recently watched and endorsed by the director of Saturday Night Fever, no less. This recipe is in honor of Susanne! You go, sistah’ soul. You go! 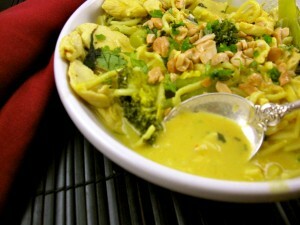 Thai Chicken Soup Ahhh…lemongrass, ginger, garlic and chilis. What could be better aromatherapy than a combination of these simmering smells to shout: I’m awake! I’m alive! And if you’re suffering from a cold, this may be exactly what the doctor ordered to clear your sinuses. The next time you’re craving chicken soup, try this one on for size. Korean Hot Pot This most ancient of Asian recipes is a party in a bowl. I had a hot pot in China that included duck’s feet but I promise you that this recipe does not incorporate the “delicacy”; I took the liberty of substituting chicken and tofu. 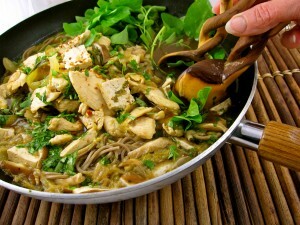 It’s replete with other goodies such as kim chee, soba noodles and watercress (why not?). In February, hubby and I travel to the warmer climes of Kenya and Tanzania on safari (and to visit an old friend), to glimpse the way the world might have looked before mankind. It’s one of those trips we’ve been saying we’d do forever, but the expense, the vaccines, the two consecutive overnights in airplanes to get there have been a bit off-putting. But, sigh, it’s the sub-Saharan. Free-range elephants, lions, zebras, rhinos…if not now, when? 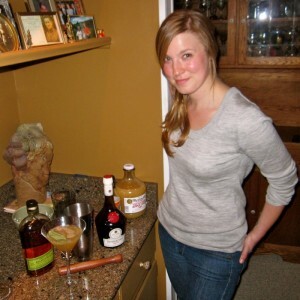 She’s No Angel: Holiday Musings on Victuals and Vice. Like a thunder of army boots marching into town, I dread the inevitable scourge of New Year’s insight promoting radical behavioral shifts sure to trample me next month. December offers us carte blanche; Eat, Drink and Be Merry. But January draws nigh, when some of us find ourselves hamsters on a double wheel of guilt trips, agonizing over the previous year’s excess of food and drink. Are New Year’s dietary resolutions punishment for last year’s sins? Pain aside, self-flaggelation can be so boring. At the moment, I’m trying on a more enlightened approach, modifying behavior that could steer me to 2019 self-loathing in the first place. I’ll begin with alcohol–my poison, my friend. 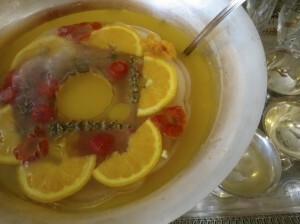 Special Occasion Punch (champagne on the side). Long gone are the days of pounding hangovers, when I couldn’t remember if I served that dessert at my dinner party the previous evening. These days I sip slowly, enjoying the complexity of a vintner’s blend or bartender’s house concoction (Pig’s Punch featured in above pic; an alcohol-optional punch on the left; additional beverage recipes in the Beverages pull-down in the right column). Yet, I remain no angel. Nor do I wish to be. But do I really need that second or third I’m-taking-an-Uber glass just because the buzz is fading? My health certainly doesn’t. Every doctor and medical website will tell you this so don’t believe me. Of late, I’ve been stocking my fridge with coconut water, fruit juices, seltzer waters and assorted bitters. 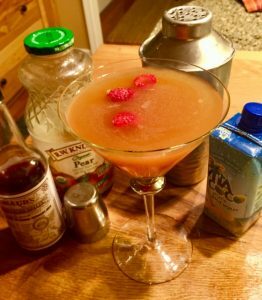 I can make myself a mean non-alcoholic cocktail (yes bitters have alcohol, but really?) while binging with hubby on Sharp Objects. Out and about, I can begin with seltzer and lime and move onto my high-octane treat mid-stream. Or vice versa. Must I have another? Well, alright. I’ll have a Sweet Vermouth and Soda, thank you very much. Onto food. Alcohol may taunt me, but when it comes to food, I lucked out. Well-prepared, nutritious food is no sacrifice for this writer. Of late, I’ve been craving pastas with creamy Alfredos. Here’s a treat, an Alfredo recipe with chicken and broccoli with half the calories you’d devour in a restaurant. 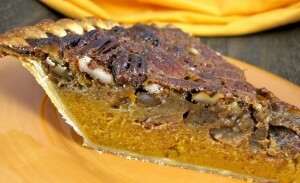 I will indulge in the things that tempt me (I’m looking at you Sweet Potato-Pecan Pie) but not to egregious excess. You readers are compassionate souls, folks intended to be on this planet for a reason. So give yourself a break. Hold hands with me (I need your support!) as we tread gently through December, ready to face the advent of 2019, tummy’s tight (gut or no gut), heads held high and clear. Need help with holiday menu planning? Tap the Holiday Cookbook (the golden ball in the column on your right) and you’ll find dozens of my holiday favorites. Have a safe and happy season, friends!